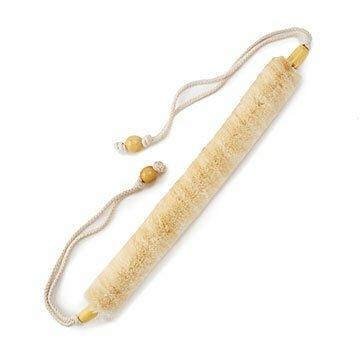 Scrub-a-dub-dub your hard-to-reach back with natural fiber brushes that exfoliate and boost circulation. When you see “skin care,” you think “face,” right? But the skin on your back needs love, too. Problem is, it’s hard to reach, unless you happen to be a contortionist. These all-natural brushes make it easy: just hold the handles and pull them back and forth. Give yourself a delicious back massage while exfoliating and revving up your circulation, and walk out of the tub or shower glowing with good feeling. The softer brush is Bangladeshi jute, the most popular natural fiber after cotton, and the medium-stiff one is Kenyan sisal that grows all year and doesn’t need fertilizer or pesticides. Both are handmade in Sri Lanka by men and women protected by the ethical regulations set by the International Labour Organization. Rinse Clean, shake off excess water and hang to dry outside of the shower.